Our family has been volunteering with Blue Ridge Boxer Rescue for almost two years. While it is not always easy, the joys seem to always out shine the heartaches. Earlier this week, I received the most sincere and heartfelt update from a former adopter, Rebecca Z, reflecting on their year with Allee. Her update brought tears of joy to my eyes. Rebecca and Hector are wonderful people and have provided Allee with the loving and supportive environment that she needed. Allee’s transition was not easy but they never gave up on her! With Memorial Day Weekend here and gone I am reminded of how we spent last Memorial Day weekend…a Saturday morning drive to Greensboro to pick up a sweet boxer named Allee for a “trial week or so” in our home, a Saturday (and Sunday) filled with rotations with Allee and resident dog Tango and feeling like those rotations would NEVER end, a girl who disliked her crate so much that she broke out of it twice on the first day. Let’s face it, a “trial” visit to our home was never going to happen…only a permanent move was in this precious girl’s future. Here we are, a year later, more and more attached to our beloved Allee every day. We’ve had our fair share of struggles. Hector, Tango and I have each been victim to Allee’s quick bite and sharp teeth. Last year’s 4th of July was in the midst of Allee’s quarantine for biting a neighbor. Allee sometimes still has difficulty when we come across other dogs on walks, but going ona walk is one of her favorite things to do. The daily highlights far outnumber the struggles we’ve had in our first year as a family. Allee is…a dog who can’t wait to be allowed on our bed each morning after her trip outside and a delicious breakfast; a best friend to our 3 year old male Tango; a (mostly) laid back sweet girl who just wants to please you and be by her owner’s side; a silly girl who doesn’t so much do the boxer bean, but rather jumps up and down on all 4 legs when you get home. But most of all (to us at least) Allee is a Zambrana for life. Thank you for all you did for our beloved Allee and for all you continue to do for the countless boxers you help each day! 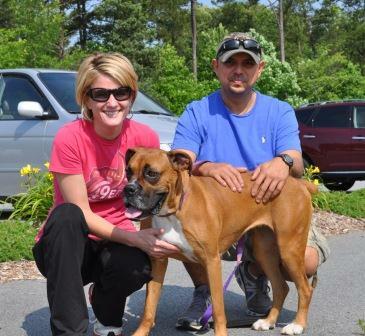 THANK YOU Rebecca and Hector for giving Allee the second chance in life that she deserves! You all are an AMAZING family! 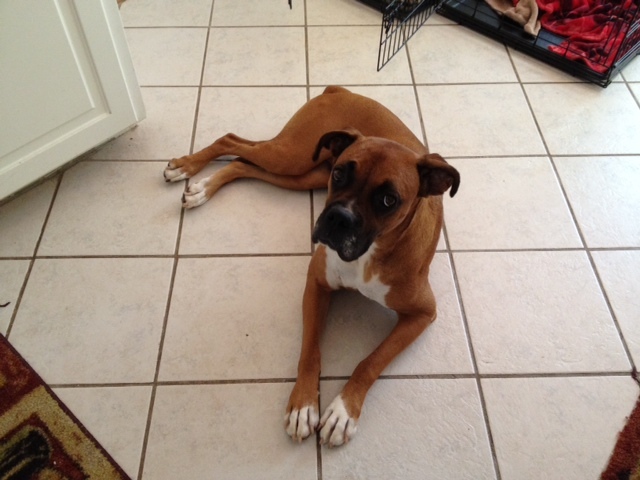 This entry was posted in Blue Ridge Boxer rescue, Boxers, Dog Rescue, Pet Finder, Rescue Dogs and tagged Blue Ridge Boxer Rescue, boxer rescue, boxers, foster dogs by BoxerRunner100. Bookmark the permalink.